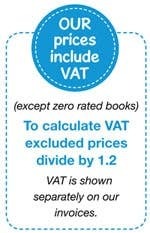 All prices are inclusive of VAT (where applicable), at the current standard rate. Organisations exempted from paying VAT are advised to order their goods and pay the VAT, and then make their own arrangements to claim it back. We are unable to deduct it for you. VAT is automatically added or deducted according to delivery address when ordering online in cases such as Channel Islands, outside the EU, certain BFPO numbers etc. Baker Ross Ltd. reserves the right to increase prices if the standard VAT rate should increase.